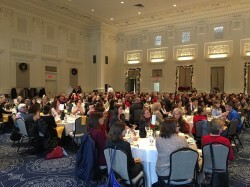 Queen’s Bench is the Multnomah County chapter of Oregon Women Lawyers. Queen’s Bench luncheons are held every second Tuesday from 11:45 a.m. to 1:00 p.m. The monthly luncheon registration and schedule are available on the Queen’s Bench website. For a question regarding registration or payment, email the Programs Committee. Want to ask a question about the Chapter? Email Queen’s Bench.